With more than a third of all California communities relying on semis for the delivery of different types of goods and services, semi-truck cleaning becomes a necessity. This earns continued patronage from regular customers, attracts new ones, keeps drivers healthy and wards off DOT officials. But such a huge vehicle can be a challenge to clean, right? Yes, it can be, but knowing how to do semi-truck cleaning properly can make the job a bit easier. How to do it? Read on. Before buying any truck detailing supplies, consider how each product will affect the world we live in. Yes, the drought may seem to be easing up, but its effects, according to experts, will last for another two to three years, depending on our water consumption and wastewater disposal. Use water wisely and prefer organic cleaning materials over chemically laden ones. You and your truck will benefit too. You’ll be cleaning a huge vehicle, so it’ll be cumbersome to go back and forth just to get the things you’ll need. Get a basket or pouch, tie it around your waist, then put all the materials you’ll need in there. If you buy liquid cleaning products by the gallons, transfer small amounts in separate plastic bottles. 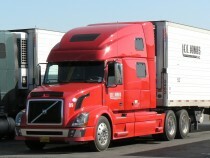 Do not limit your semi-truck cleaning to the exterior alone, especially if your semi delivers foods or medications. Clean your semi’s interior, from the dashboard to the seats all the way down to the carpets. And don’t forget your trailer – it’s where the products are. If you can’t give it a thorough steam washout, consider the experts. A quick wash in an automatic car or truck wash might give your semi a shiny appearance, but upon closer inspection, you’ll find that toughened dirt and mud are still present in areas that automated brushes can’t reach. If you’re going to clean your semi yourself, make sure that dust, dirt, grime, and other types of contaminants are removed. Otherwise, they might settle deep into the crevices of your vehicle and lead to premature rusting and deterioration. Equally important in semi-truck cleaning is to dry the entire vehicle. Use huge microfiber towels, fan or blower for this purpose. However, drying an entire semi can take a lot of time. You can hasten or even skip the drying process by using steam instead. Wax it, buff it and seal it. Doing so will not only make your ride gleam to perfection but will also give it an extra layer of protection against rain, sunlight, stone chips, sand, and other natural elements. A word of caution, though: do not attempt to buff your truck if you are not adept at using a buffer. Using the wrong buffer head and angling it improperly can damage your truck’s paint. Cleaning a huge vehicle like a semi-truck can truly consume a lot of time and effort. Why not call us at DetailXPerts instead? Our truck detailing service strips all contaminants away from your semi, inside and out, leaving you with a vehicle that smells fresh and looks sparklingly clean all over. A true spa treatment for your beloved possession!